Three Rivers Press, 9780307464637, 240pp. Jane Borden is a hybrid too horrifying to exist: a hipster-debutante. She was reared in a propert Southern home in Greensboro, North Carolina, sent to boarding school in Virginia, and then went on to join a sorority in Chapel Hill. She next moved to New York and discovered that none of this grooming meant a lick to anyone. In fact, she hid her upbringing for many years--it was easier than explaining what a debutante "does" (the short answer: not much). Anyone who has moved away from home or lived in (or dreamed of living in) New York will appreciate the hilarity of Jane's musings on the intersections of and altercations between Southern hospitality and Gotham cool. 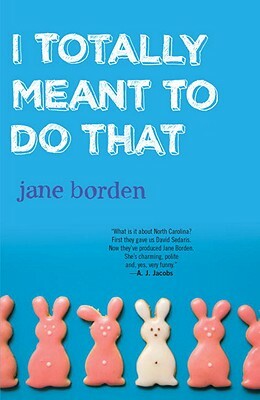 JANE BORDEN has contributed to Saturday Night Live, the New York Times Magazine, Comedy Central, VH1, Time Out New York, Modern Bride, and the New York Daily News. This is her first book; to find out where she lives, you'll have to read it. "What is it about North Carolina? First they gave us David Sedaris. Now they’ve produced Jane Borden. She’s charming, polite and, yes, very funny." "The classic story of Country Club mouse meets City mouse, a sweet reminder of what it feels like to be new in New York." "If you took Mark Twain, shaved the mustache, added lady parts, and dropped him in present-day Manhattan, he’d wind up writing this fabulous book. Instead, the universe provided Jane Borden, who nailed it." "Reading this charming and zany debut, I just wanted to hug Jane Borden. Out of all the North Carolina greenhorns who ever navigated the funky streets of 21st century New York, she may be my favorite. And she can write a sentence too!" "I love how sincere Jane is while being every bit as funny as comedy writers who are detached and ironic. This is a deeply personal and hilarious love letter to both New York City and the south. I never thought I'd say those words."